Perhaps you have seen the large sign on one of the buildings of the world headquarters of the Jehovah’s Witnesses “Read God’s Word the Holy Bible Daily”. Without doubt this is good advice. And it is true that the organization does encourage bible reading. However this good advice is counteracted by discouraging deep bible study without the publications. The organization does it’s utmost to ensure all JWs continue to see all bible texts through the lens of the Watchtower. Because of seeing the bible only through the Watchtower thought-adjuster the average JW probably has a hard time finding bible reading interesting. After all if it’s all spelled out in the pages of the publications, pouring over the pages of the bible wouldn’t seem all that important. For this reason in my opinion there are few real students of the scriptures among the witnesses. There are a number of doctrinal experts or proof-text experts that know all the texts by memory to defend JW’s beliefs, but this is not the same. When I was an asleep JW I was quite versed on doctrinal points and where to go in the bible to “prove” the rightness of JW doctrine. I was an avid reader of the publications but didn’t do a lot of bible reading outside the assigned chapters for the Theocratic Ministry School. This meant at times I would go years without reading large portions of the greek scriptures in their context, since the assigned chapters would rotate to the greek scriptures only every few years. 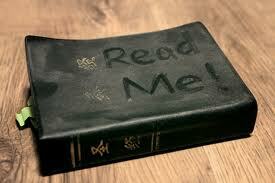 1) Be sure to make bible reading enjoyable especially if you are unaccustomed to reading large portions of the bible. I would suggest you start with Matthew and proceed through Revelation. Read through the New Testament a few times before starting with the Old Testament. If you are used to the New World Translation, use a different translation. For your very first read through the bible you may want to use a paraphrase version such The Living Bible or The Message. These versions will give you an overall feel for the general message of the bible and are worded in a way that is more interesting to the average reader. However, I would strongly recommend against the use of a paraphrase for deeper bible study, they are inadequate for that. For deeper bible study you will want to use a translation that uses a more “word for word” approach. After reading the NT through once use a different translation. If you used a version such as The Living Bible for your first read, use a translation that uses a more word-for-word approach such as the English Standard Version for your second read. Then switch to a translation that combines the thought-for-thought and the word-for-word approach such as perhaps the Holman Christian Standard Bible. By switching translations we make our minds think more about the meaning of what is written instead of just the words, which can happen if we only use one very familiar translation such as the NWT. 2) Take your time. I would recommend against sticking to a very rigid schedule of having to read a certain amount of material each day. The goal is to understand not to mark another chapter or book off the checklist. If you don’t understand a certain passage read it out of another translation. I often go to biblestudytools.com to be able to consult several translations of a particular verse. I don’t believe it is a good idea however to get too bogged down the first couple times we read the bible with too much additional research, there will be time for that later when we begin to dig deeper. 3) Keep your mind focused. It is quite easy to be reading but be thinking about something else. One thing I do to focus my mind is read aloud or mouth the words. If you are feeling lethargic during your reading time, perhaps doing a few jumping jacks will get your heart pumping and make the sleepiness vanish. 4) Read with an open mind. Try not to have a preconceived idea about what certain passages say. Granted this is easier said than done. Especially as former or current JWs we have all kinds of preconceived ideas about what the scriptures say. If we read the bible looking to prove our beliefs on a certain subject we will undoubtedly take things out of context. We should read keeping in mind what the bible writer was trying to say to the original receivers of the message. 6) Start and end with a short prayer. Thank you for your thoughts here Andrew. Psalms chapter one is the essence of just some of his love and a pure relationship with his very soul. When we let the father touch our hearts we will understand him more and more every day. We need nothing else. No man. No religion or organization. Its all about His very heart and the relationship he desires to have with each and every one of us. Also the words in the little books are his link to out minds. A treasure chest of his powerful and connective love. Our father wants us to realize not just history and prophecy are the all important things. BUT! a real on going relationship. His heart connects with our heart and mind when we are in the word. He shows us that the scriptures and the way he wants us to learn is not so complicated. It truly is a simple gospel. Next time anyone is in the company of a little child when he or she asked questions about the father. take note of the way they receive his word and ask questions. This, for me is such timely council, I have spent a lifetime reading the publications with just a cursory study of the scriptures. Now I am feeling a real spiritual awakening. I recently resolved to really read and study the bible, but I find that I have traded a lot of the time I spent reading WTS publications for researching on the net. This is really just another distraction from from the true faith building food that can be recieved from study of the scriptures. thank- you for this timely reminder. Let us all come to love Jehovah and be known by him. Please listen to true wisdom from a child like faith. This little boy has wisdom beyond his years. I would say he reads his bible everyday. Wouldn’t you? Your sister Ruth in out great God. This is the BEST advice anyone can put into practice. Sometimes when I am feeling spiritually weak I always notice that my bible reading is down. As a JW I too read the publications way more than the bible. “Make Sure of All Things” and “Reasoning From The Scriptures” was at the top of my list. I bound both of those books with my Bible and found myself reading them way more often. I bookmarked biblestudytools.com and will check that out. I also purchases a Holman Christian Standard Bible recommended by you and enjoy it very much. I find the web site bible.cc very helpful too for comparing scriptures and it has many other useful tools as well. It is to bad the advise you just gave in this article is something JW’s will never read in the WT publications. They do not condone deep bible study as a group or without their “glasses” being worn. That’s an amen sister Ruth,the boy does his homework,as all the writers here are doing.JJ,don’t you despair,there are “7000 among us that have not bent the knee to Baal”.They are enjoying the research and reasoning you men are writing,and to judge from their comments,and I have got to know ones by visiting on my e-mail(johnstoutenburg@gmail.com),they have brought their brains,along with their hearts here.Truly the Eagles are gathering…..Keep publishing more,and more from the simple Gospel,we don’t worry about that other camp that much,they aren’t that interesting anymore. This is really helpful Andrew. I will use this when I do my bible reading. When I was a child the meetings use to go right over my head. I was around when they did the Babylon the Great book in the book study (the 1st time) and we did the first part as well as the secong part. It seemed to go on forever! And as a child of 5 or 6 years old I didn’t have a clue. I used to enjoy the ‘Paradise Lost to Paradise Regained’ book as it gave me an idea of the bible’s history. However I would sit in the meetings bored stiff and always wanted to go to sleep on my dad’s knee, sometimes he allowed me to, especially at our 5 day, all day long assemblies! But then I learned to read and found myself lost in the bible while the meetings still went over my head. The stories in the bible were wonderful and I would sit there in the meeting reading them while the speaker droned on. I still have a tendency to do it! A scripture will be read to make a point but I find myself lost in the rest of it and find I have read 2 or 3 chapters while the brother giving the talk has moved on to other things! The only books I found a struggle with were the prophets but as I got older I began to appreciate them more although they do take a lot more effort to read. We do the weekly bible reading in our ‘family worship night’ and at the moment it’s Isaiah, but I did enjoy having quite a long discussion over Isaiah 11:1,10. God’s word is a wonderful gift! I lost the first vowel,so will sustitute with..’…comprende?Sister D.,I know how it’s going to be for you,with the husb’nd still ‘n elder,’nd no doubt,’ good guy.Be p’tient with him.He m’y never see things like you do. In his mind,he must st’y loy’l to J.This c’lling out of m’ny of us Witnesses to this new w’y of thinking is ‘ new m’rvel in itself,just now being understood by some.I ‘m 57 yrs.old,r’ised in truth,P’r’dise book t’ught me,too.I see J.W. now w’s to me like gr’des 1-6 in school.Now I’m in Jr.High,everything deeper,underst’nding better.Org’nis’tion is in the h’nds of men of question’ble motive,not te’ching truth Jesus t’ught concerning kingdom hope ‘nd Holy Spirit.M’ybe they h’ve right he’rt,I c’n’t s’y,but I went on to the next level,with the Holy Spirit c’lling 5 yrs. ‘go.Won’t go b’ck now,why repe’t 6th gr’de over ‘g’in?This site is for persons c’lled by God to go to the next level;simple.We c’nt deny this urge to grow,like every norm’l child must.But only those who seek to underst’nd ‘nd grow in knowledge will come here.This is ‘ think t’nk for c’lled Christi’ns,not indoctrin’tion st’tion.Comprende,Herm’n’? At this time of year brothers the world would love to pull at your heart strings. The glitter the glow of a unnatural warmth like feeling. But take heed. Jesus said “I have chosen you out of this world” On this account the world will hate you. bare in mind a slave in not greater than its master. dizem que não há. inferno e a questão do satanás onde será posto?